ELY, Minn. – The immense vault of cobalt sky shimmered with the thousands of stars you can see only when the closest city is five hours away. Swirls of powdery snow chased one another over the frozen lake, and the lanky spruce trees along the shore turned bluish in the last afterglow of dusk. Four Canadian Inuit dogs panted as they pulled a sled swooshing in the distance – too much distance, I suddenly realized, shaking myself from my reveries and breaking into a run to catch up.Those dogs were pulling the sled that I had been on – until I fell through the ice. I was on a dogsledding trip last January in Minnesota’s Boundary Waters wilderness on the Ontario border; the temperature was 3 degrees, not counting the wind chill. We’d been getting off the sleds to pull them over beaver dams, then jumping back on, when the sled I jumped on broke through the ice. A guide and my companion pulled me up, but my boots filled with water. 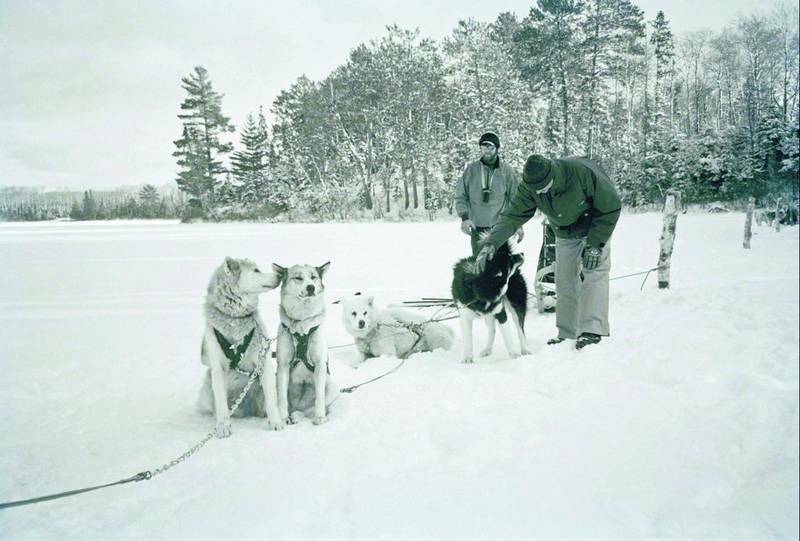 Now I was running behind the sled – as I’d been ordered to – as a way to prevent frostbite in my feet.The five dozen dogs at Wintergreen are all pure-bred Inuit, the original breed of arctic dog. (The breed, recognized by the Canadian Kennel Club, is also called the Canadian Eskimo dog.) Shunned by most commercial outfitters, they are the choice of both polar indigenous peoples and explorers, the “Sherman tanks” of the mushing world, said our guide, Mike Anderson. They can pull more than double their average weight of 80 pounds and are built for distance rather than speed, doing about 6-8 mph on compact snow.”Just make sure they don’t run me over” was Anderson’s last instruction before he set out on skis and our team rushed after him, snaking along the lake’s rocky shores.After stopping twice to scrape the sleds and the guides’ skis, we started racing against the fading sunlight, still miles from the lodge. Alessandro and I alternated running after the sled to give Thule and her team a break. Williams gave up his sticky skis. At that point, we started encountering the beaver dams. In each case, we had to let go of the sled, get it unstuck from the vertical wall and jump on it as soon as it cleared the crest. Jump after jump, this was getting into territory adventurous enough to warrant bragging rights. Then came the loud crack and the rush of numbingly cold water. With synchronous yelps, the dog on the rear left and I went in together. Alessandro and guide Nick Williams grabbed me so the water only reached into my boots, quickly seeping through all the various layers of pants.”Do you need a change of clothing?” Anderson asked. But I didn’t want to stop and strip, so he told me to start running to keep my toes from freezing.Anderson zoomed off to take the two other sleds to safety before total darkness. Alessandro and Williams took turns on our sled. The dogs howled. I ran, trying to stay on the harder snow in the sled tracks despite my numbed feet. I kept thinking of how quickly hypothermia set in for the Jack London characters whose stories I’d devoured as a child. But the twinges of terror I felt were mixed with shots of pride for being a tried-and-true adventurer of the Great North. White Iron Lake hadn’t seemed this large in daylight, or this beautiful.About an hour later, a bobbing searchlight told me Anderson had come back to the rescue. He led us to the shore where Schurke was waiting in a toasty truck.”So you got the complete package?” Schurke asked, chuckling. Much as I played it cool, right then I would have preferred some stunned admiration for what I thought was quite a feat for a city girl.The sky had turned black by the time we left. Sitting in the utter darkness before starting my car, I knew that nowhere can a person feel as small as inside the great, still frozenness of the great North.